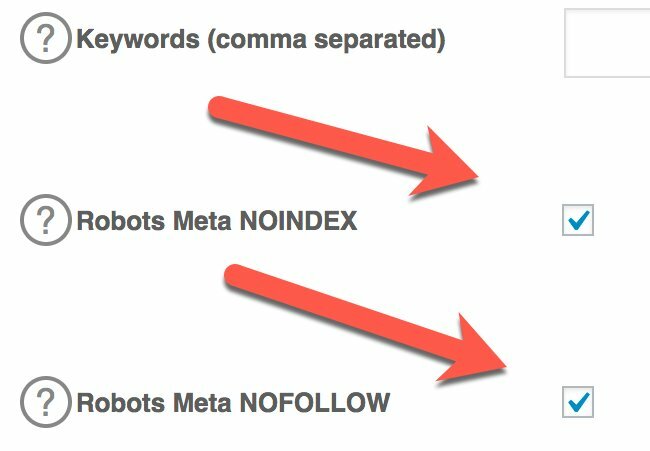 Search engines like Google, Bing & Yahoo are after ONE thing. The most relevant content. If you can build out your website in a way that is ready for SEO (as discussed in the last lesson) and create quality, relevant content, you are going to have a bright journey ahead of you within the online world. The thing that most people stress about is being a "writer", you DO NOT have to be a writer to be successful online. You simply need to communicate with your audience, the same way that you would with a friend or a family member. And if you put the emphasis on helping people, you are going to be able to build trust, which is going to lead to long term and sustainable success online. As both a Starter/Premium member, you have access to the SiteContent platform here at Wealthy Affiliate. This platform offers you some incredible features as a writer that will lead to more efficiency, accuracy, and speed with your content creation. 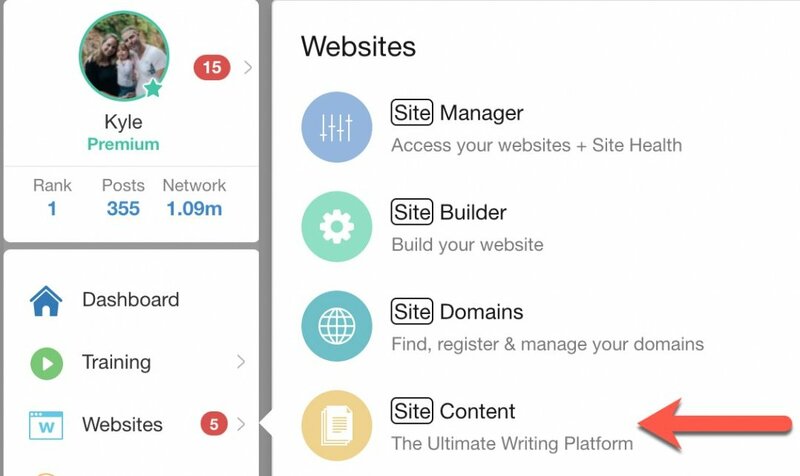 You can access the SiteContent platform through the Websites menu. SiteContent offers you some unbelievable features that are going to make your life as a "blogger" much more efficient. This is where you are going to be creating all of your content moving forward. 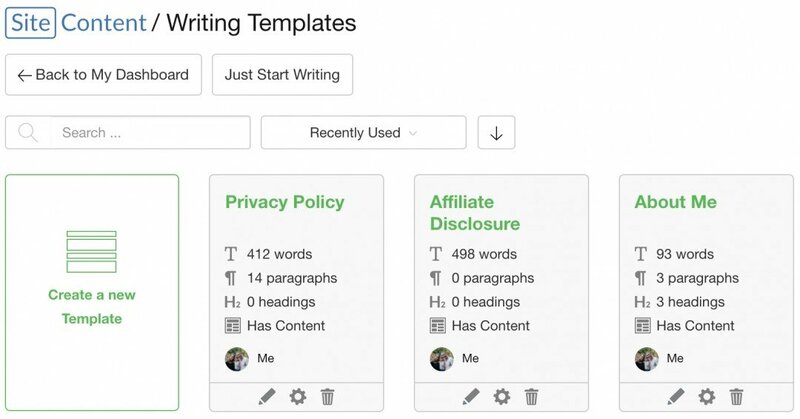 You will be setting writing goals and leveraging the "feature rich" platform for writing. 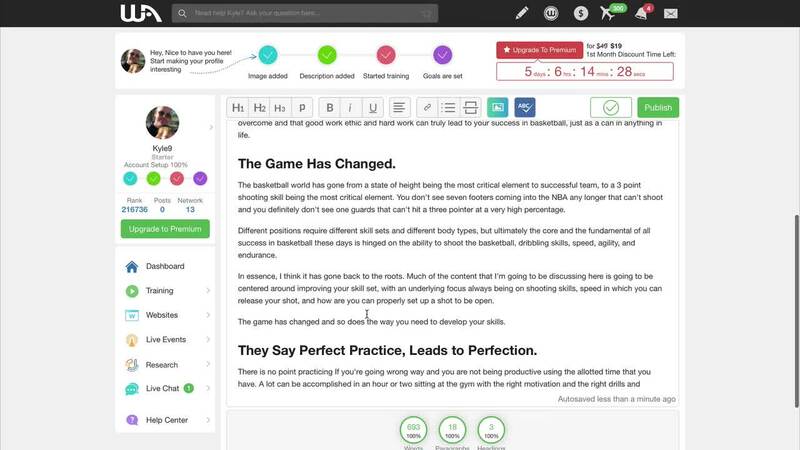 If you are worried about your writing skills, the SiteContent interface is going to help you understand where you are making writing errors and help you correct them in a very efficient manner. It is going to be your go to writing tool moving forward and it is exclusive to Wealthy Affiliate members only! I have created a little walk-through of SiteContent, showing you around the platform and how to best benefit from it. To establish a brand online in any niche, you need to build trust with your audience. The best way to initially do this is through an "about me" style page. Every successful website will have some information about their brand, who they are and why they want to help people. Your first task today is going to be to create your About Me page and you are going to be doing this directly within the SiteContent platform. Within your Templates tab, you are going to see that you already have the framework for your About Me page already outlined. 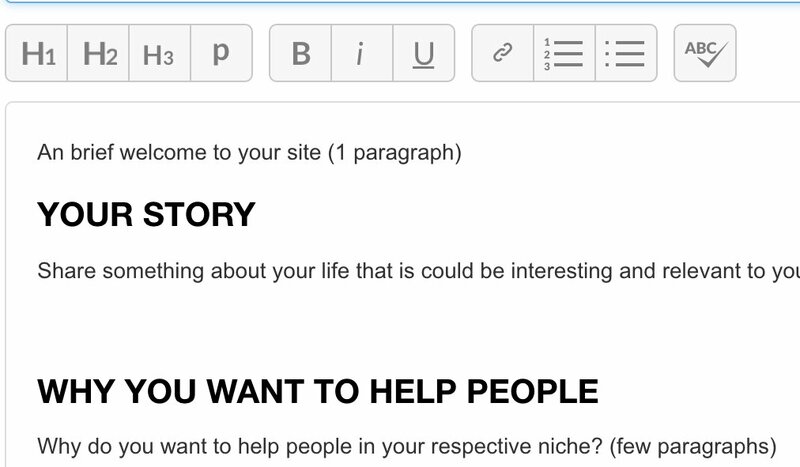 Simply click on the About Me template and it will take you into the SiteContent editor. This is where you will be creating your content for your About Me page. The first thing you are going to want to do is choose a title that is appropriate for your about me page. There are several options that I suggest you choose from in terms of your naming convention. The most natural and the option that I have always used because I feel it resonates and creates the most trust is "About Me" or "About Kyle", because it is the most direct. It feels like I am here for you and I am here to help (which is the case with every site I create). Then you will want to populate the content. Do know that this is just a guideline, as you edit this post you can add new headings and of course you are in full control of the content and your story. This is not a rigid exercise here, you are YOUR OWN brand and you can build out your content in any way you like, but this will give you a good guideline here. After your are done doing this you will be click the Publish button in the right corner, just above your editor. 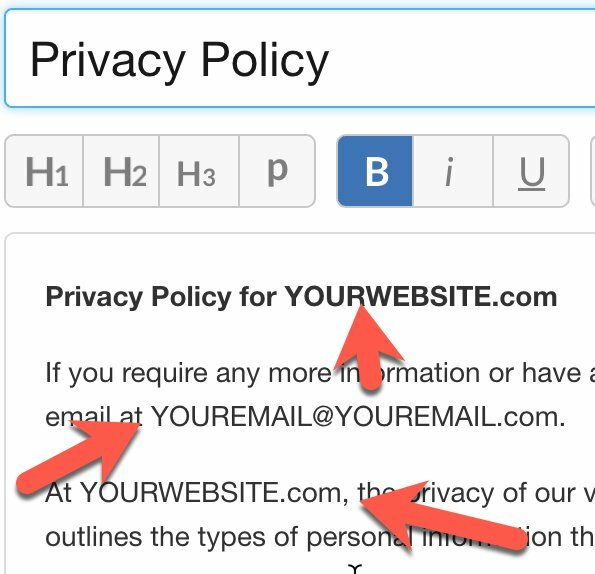 This is going to allow you to publish directly to your website (see below). Upon clicking Publish, you will get a pop-up that will allow you to choose how you want to publish the content. This is a 4 step process. 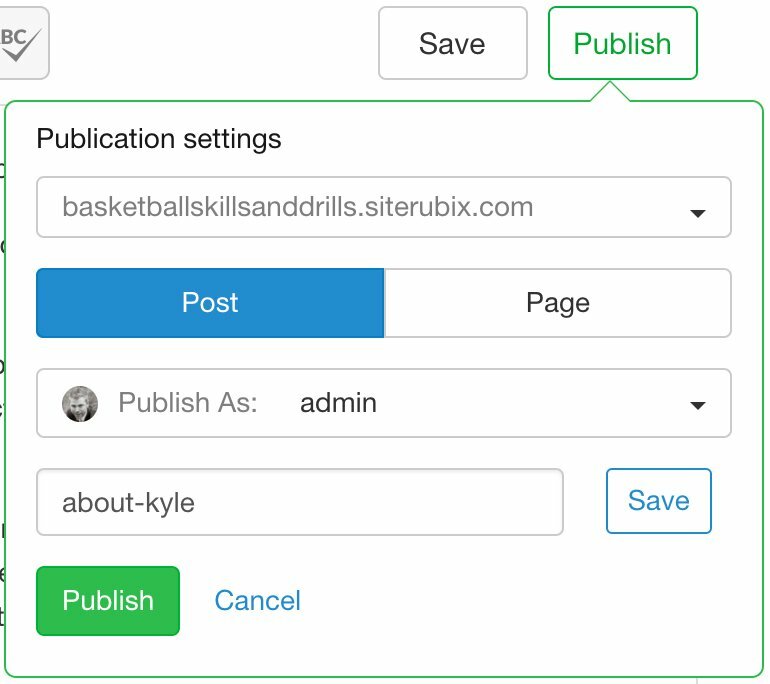 Step 1: You will want to choose your website that you want to Publish to, in this case it will be my "basketballskillsanddrills.siterubix.com" website. Step 2: Choose "Post", not a "Page". The reason is all POSTS allow for comments on them and this is a page on my website where I am going to want to allow people to leave comments and feedback. Pretty much every article you publish moving forward will be done so as a "Post". Step 3: Choose the user. If this is a new site, you will likely only have an Admin user. That is fine, choose that as your user. Step 4: Choose the URL plug. Leave it "as is". You shouldn't need to change your URL plug, this is something that you can leave. The Click Publish. Upon doing so, SiteContent is going to run a duplicate content check, and then publish the content to your website. Since you wrote your About Me page it will be 100% unique. This could be any email you want, you could even create a free gmail account for the purpose of this. Or if you don't feel comfortable leaving your email at the moment, this can be something that you provide to people at a later date.